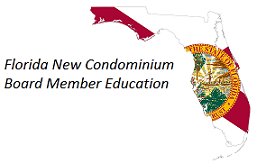 This Division-Approved course satisfies the State of Florida's Statutory curriculum requirements for condominium association officials. Certificates provided upon completion. Board members must give their certificates to the Association Secretary. Condominium association officials wield substantial power that can significantly enhance or detract from the quality of life of the communities they serve. That power must be exercised judiciously and in a manner consistent with the regulations set forth in Florida's Condominium Act. In fact, the State of Florida holds association officials to the same standard as officers of a corporation, requiring that officers' fiduciary relationship to unit owners form the basis of all their official actions. By requiring association officials to certify their knowledge of statutory requirements and association bylaws, the State makes clear that ignorance of the rules is neither an excuse for mismanagement nor a legal defense to criminal charges stemming from their official actions. Informed by the knowledge conveyed in this course, condominium association officials can execute their official duties skillfully and confidently. This course can be completed at your leisure, from any computer, at any time. You can pause and resume the course where you left off. You will receive a Certificate of Completion immediately upon completion of the course. (Discounts are available for Condominium Boards or Property Management Companies by calling us at 1-800-521-9667). To instruct condominium association directors and officers in discharging their fiduciary duties to members of their condominium associations, in keeping with State of Florida's statutory requirements for condominium association management education. execute duties relating to obtaining bids for and entering into contracts on behalf of the condominium association in a manner consistent with Florida's Condominium Act and the association's bylaws.